Amelia Earhart was the first woman to fly solo across the Atlantic Ocean. Amelia Earhart's legacy lives on not only through her flying accomplishments and contributions to American aviation, but through her work to motivate women to pursue their careers and her support of the Equal Rights Amendment as well. 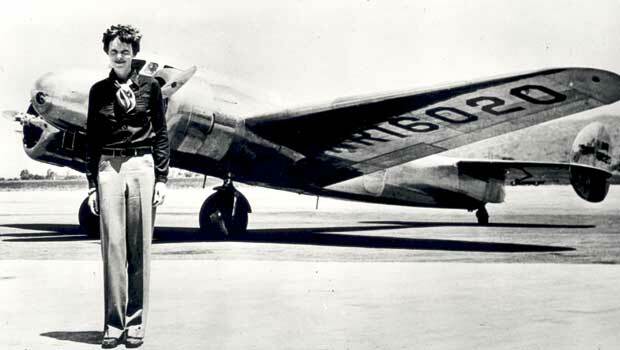 Here are five reasons we continue to honor Earhart's memory. 1. Amelia Earhart was the first woman to fly solo across the Atlantic Ocean. She was the second person to accomplish this transatlantic journey - the first was Charles Lindbergh. Earhart flew from Canada to Ireland in May of 1932, and earned the respect and admiration of aviation enthusiasts around the world. She later became the first woman vice president of the National Aeronautic Association. 2. Before she was a pilot, Earhart was a nurse's aide. After two years of finishing school and a visit to her sister in Toronto, Canada, Earhart became a nurse's aide with the Red Cross in Toronto and treated wounded soldiers returning from battle during World War I. New York City became her next destination, where she briefly enrolled as a medical student, before joining her parents in California. 3. Earhart knew she wanted to be a pilot after her first flight. In 1920, Earhart attended an air show with her father in California and went up in a plane for the first time. With money from odd jobs and help from her family, Earhart paid for flying lessons and eventually purchased her own plane, a yellow Kinner Airster, which she called The Canary. Earhart would go on to set many aviation records, including the new altitude record for female pilots (14,000 feet, approximately 4,267 meters). She was the first woman to receive the Distinguished Flying Cross from Congress. 4. In 1928, Earhart was chosen to be the first female passenger on a transatlantic flight. Earhart was the navigator for the pilot and co-pilot. The plane, named Friendship, successfully flew from Canada to Wales. The flight took about 21 hours. Upon her return to the U.S., she was celebrated with a parade in New York City. Earhart was also invited to the White House to meet President Calvin Coolidge. After her transatlantic flight aboard Friendship, she wrote the book, 20 Hours, 40 Minutes about the journey. Earhart married her publisher, George P. Putnam, in 1931. Putnam had also published work written by another famous pilot, Charles Lindbergh. During the years of 1928 to 1937, Earhart was a prominent public figure and was affectionately dubbed Lady Lindy by the press. She wrote books and newspaper articles, joined the faculty at Purdue University, and served as an associate editor for Cosmopolitan magazine. 5. Her disappearance on an attempted flight around the world is still a mystery today. In June 1937, Earhart attempted to circumnavigate the globe. After two-thirds of the journey was completed, Earhart and her navigator, Frederick Noonan, disappeared somewhere over the Pacific Ocean on their way to the Howland Island, a tiny island between Australia and Hawaii. The circumstances around her vanishing remain a mystery to this day, though many investigators speculate that her plane ran out of fuel before reaching Howland Island.